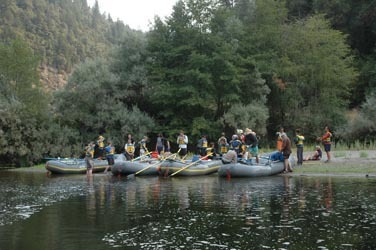 The lower section of the Klamath is a prime river for a long, multi-day river trip. It’s possible to spend as little as one day on the river but many boaters choose to extend their whitewater experience on the Klamath to a week or two. Planning for a long trip on the river is entirely doable for a private boater but to pull this off it’s nice to have a decent amount of experience packing food and organizing gear. Keep in mind that commercial rafting companies and guided inflatable kayak outfitters will do it all for you which can take a lot of stress out of the process. Private rafters and kayakers are not required to obtain a permit for the Klamath River. Commercial Outfitters must have a permit to run trips on the Lower section of this river. Take your pick of various developed (Sarah Totten Campground, O’Neil Campground, Fort Goff Campground, Dillon Creek Campground) and undeveloped campsites along Highway 96. You need a permit if you are planning on having a camp fire with in Klamath National Park. Be sure to check for fire bans before you head out also. Not ready to attempt a class VI rapid? Then be prepared to portage Ishi Pishi Falls at mile 76. The last take-out before the falls is 3.6 miles upstream above the mouth of Reynolds Creek. You’ll see a dirt road leading to the Highway and it’s best to portage at this spot. You’re close to Sommes Bar at this point also. Since Highway 96 follows the Lower Klamath, there are many access points to the river and spots to stash vehicles. The total mileage for the full run from take-out at Weitchpec to put-in at Sarah Totten Campground is 95 miles. That means about two and a half merciless hours before you get on the water. Take-out (Weitchpec): Most will be traveling from the south so, take Interstate 5 North to Redding. Once in Redding catch the 299 West and follow the Trinity River to the town of Willow Creek. From Willow Creek turn right on Highway 96 and you will arrive in Weitchpec. Those traveling South on Highway 5 will reach Highway 96 eight miles before Yreka. Take-out (Salmon River Road, Sommes Bar): This popular put-in and take-out at mile 76 is used frequently by commercial outfitters. Continue driving west on Highway 96 through the town of Orleans. Look for a bridge that crosses the Cal Salmon River shortly after you leave the town. Turn right on Salmon River Road just after the bridge for river access. Put-in: Sarah Trotten Campground: Continue heading west on Highway 96 to Sarah Totten Campground.